(44 miles, 2400ft) Nobody likes conceding a DNS – ‘Did not start’ – on an event. I had entered today’s Anglezarke Amble, a 24-mile stamina-draining bog-trot, but after the Labyrinthitis attack of the last week or so I decided to do something not quite as strenuous. The last two days had seen no dizzy spells and I felt in fine form when getting things ready for the ride this morning so I decided to head out to Llandegla. Today’s route I’d done a few times before and decided to leave it more or less the same. There’s an optional hilly section in the middle of the outward journey as my route crosses the Northern end of Hope Mountain and this does skew the statistics somewhat. The weather outside looked chilly and grey, the forecast the same:- a few spots of rain and a NNE wind of around 10mph. Despite having a generally good network of cycling routes the leaving of Chester on bike is a problem if one has to cross the River Dee as there are only a few crossings- 2 road bridges and 2 footbridges, and the former are both busy. I threaded my way past the Amphitheatre and crossed the Grosvenor Bridge, heading out through Lache towards Lower and Higher Kinnerton. This is a quick road, slightly downhill, then flat until Higher Kinnerton when the road climbs steadily. I take the road past Pigeon House Farm to bypass Hope and then take the hilly section mentioned earlier, via Pen-y-parc. This descends to join the A5104 when, after turning left, the road climbs steadily over 3 miles from 136m to 308m before dropping slightly to the crossroads at Rhydtalog from where the A5104 climbs to 341m. Today there was snow on the grass verges and the distant hills were all white, merging into a drizzly haze. At Llandegla my route turns East and today this meant into the wind. 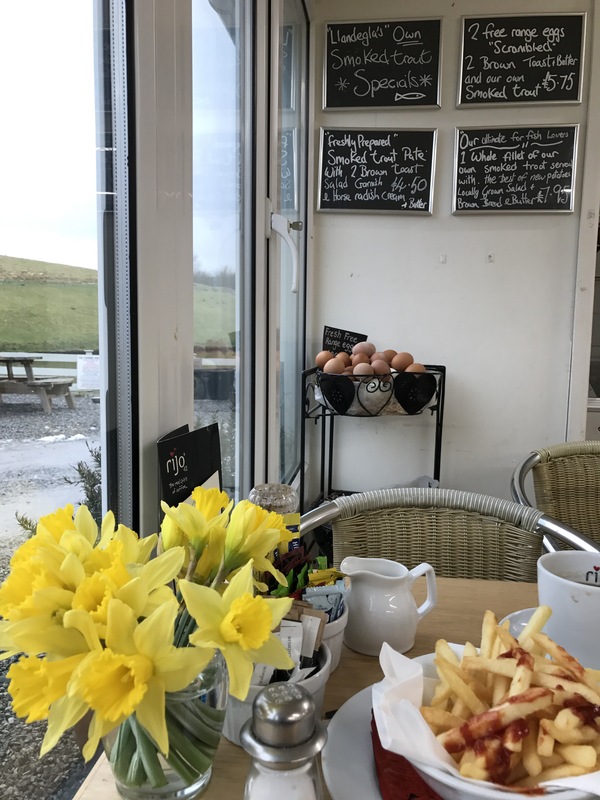 There was sleet in the air but not enough to hinder vision and I was soon at the Llandegla Fishery, where there is an excellent café. I usually end up at the Llandegla Outdoor Pursuits centre but I’ve been there many times recently, so decided to stop here for a change. A few hardy anglers were braving the cold and a few more were in the café. The menu is superb, coffee good and the French fries brilliant. In fact there were so many in my portion I had to have my scone wrapped for eating when I got home. This a place I need to come back to with the Staff Association walking club – right up their street! Continuing along the A525 I cut the corner by taking the B5430 down to Coedpoeth. Here the fun begins – a lovely descent on the B-road continues (with care) through Coedpoeth until the turning on the right to Nant Mill arrives suddenly. Now the fun become excitement as the route descends with twists and turns through the very pretty Clyweddog valley thrusting you quite quickly into the suburbs of Wrexham. The route northwards is now uneventful apart from roadworks on the Marford Hill which inserted a hiatus into a usually bumpy descent. I entered Chester from Ecclestone and over the Handbridge. It was raining steadily now but not too cold, but the warmth of home and the promise of the uneaten scone were eagerly looked forward to. So, no Anglezarke Amble – I have done that many times – but a wonderful ride more than compensated. Posted in Cycling.Tagged Chester, Llandegla, Llandegla Fishery.